Mining began in Tasmania long before the arrival of the first European settlers in 1803, for the Tasmanian Aborigines were engaged in the small-scale mining of flints, salt and ochre. The early settlers began quarrying sandstone, limestone and clay for building materials, and extracting coal for fuel. From 1803 to 1820, coal was found at several locations including Richmond and Colebrook, Schouten Island, Macquarie Harbour and Bruny Island. The first successful mine was opened in 1834 at Plunkett Point, with convicts from nearby Port Arthur providing labour. The Douglas River Coal Company's mine opened in 1849, and the Mersey Coalfield near Latrobe in 1850. However, it was the discovery of the rich Mount Bischoff tin deposit in 1871 that changed the mining landscape. Western Tasmania became the focus of explorers, prospectors and track cutters. Mount Bischoff started a prospecting boom throughout Tasmania that lasted thirty years. The first western deposit of tin found was the Heemskirk Tinfield in 1876. Extensive alluvial gold deposits were found at Middletons Creek in 1879, followed by a reef of gold at nearby Specimen Creek in 1881. The lure of gold and tin had already drawn prospectors to north-east Tasmania. George Bell's discovery of tin near Mount Cameron in 1874 caused a flurry of prospecting activity along the Ringarooma Valley and on the Blue Tier. Within three years, mines had been established at Branxholm, Derby, Bradshaws Creek (Pioneer), Weldborough, South Mount Cameron and Gladstone. The most significant mine, Brothers' Home at Derby, was established in 1876, and became the rich Briseis Tin Mine, which operated until 1956, producing an estimated 20,800 tons of tin oxide. Known as Tasmania's tin province, the north-east generated substantial wealth for almost a century. Gold made its mark as early as 1852, and continued to develop from 1860 to 1890, notably at Beaconsfield from 1877 and the Golden Gate at Mathinna from 1887. However, a decline began in north-east Tasmania in 1890, whereas in western Tasmania mining was operating at peak level. After Frank Long discovered silver-lead in 1882, Zeehan emerged as the most important mining centre, and by 1908 was Tasmania's third largest town, and the base for many prospecting expeditions. George Bell discovered the Silver Queen Mine in 1887 and the Renison Bell tin deposit in 1890. The Mount Lyell copper mine in Queenstown also emerged in 1890. It was worked as the Iron Blow gold mine from 1883, and commercial quantities of copper in pyrite were later found associated with a dwindling gold resource. The mine consolidated in 1903, when two companies, Mount Lyell and North Lyell, agreed to amalgamate. The resulting world-class copper mine has continued to support the historic town of Queenstown. Western Tasmania's third major mining field, zinc-lead deposits at Mt Read–Rosebery, was also discovered in 1890, when prospector Alfred Conliffe found a gold-bearing gossan on the western side of Mount Read. Four years later, Joseph Will found a more significant deposit nearby, which became the Hercules zinc-lead and silver mine and township of Williamsford. The mine operated between 1900 and 1986. During 1893, prospector Tom McDonald found alluvial gold and zinc-lead boulders in Rosebery Creek, and later a major zinc-lead sulphide orebody near the site of the present Rosebery Mine. Since 1920, Rosebery has been one of Tasmania's largest mines. 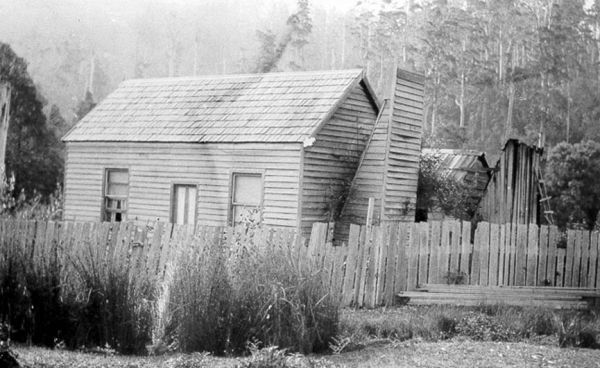 The Rosebery township, a bush camp in 1898, has become a progressive community with a population of over 2000. It remains the second largest centre in western Tasmania. Other major discoveries included the Magnet silver-lead lode near Waratah and at Mount Farrell (Tullah). In 1891 William Robert Bell, no relation to George, found a rich silver lode in the valley of Magnet Creek. 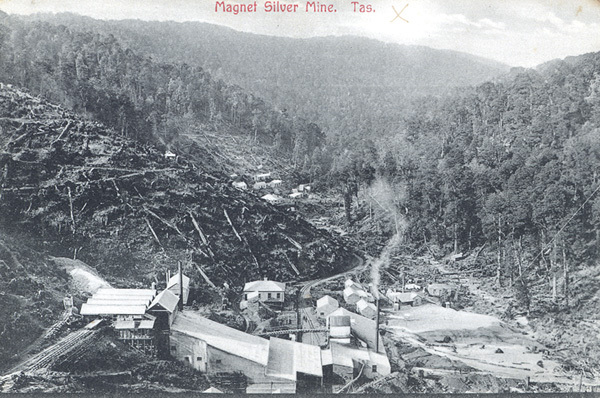 Three years later, the Launceston-based Magnet Silver Mining Company opened a mine which by 1923 had produced 6.5 million ounces (184 tonnes) of silver and 27,000 tonnes of lead. In 1932 the Company transferred the mine's lease to its employees. The Magnet Mine finally closed in 1940, after producing 38,000 tonnes of lead and 8 million ounces (227 tonnes) of silver. The next important mineral discovery occurred at Mount Farrell in 1896–97, when surveyor Edward George Innes observed mineral occurrences beside the track being cut from Mole Creek to Rosebery. The Mount Farrell Company pegged leases and mining commenced during 1898. By 1906, the mine had produced more than 430,000 ounces of silver and 4000 tonnes of lead, and a sizeable community lived near the mine. Known as Tullah, the township became famous for its narrow gauge tramway and diminutive locomotive, 'Wee Georgie Wood', which provided the only link to the outside world between 1924 and 1961. The North Farrell Mine closed in 1932 due to low world metal prices. Fortunately for Tullah, another outcrop of galena was found north of the old lode, and the North Farrell Mine re-opened in 1934, producing 700,000 tonnes of silver-lead ore by the time it closed in 1974. In 1876, government surveyor Charles Sprent found a heavy, tin-white, metallic mineral while exploring the valley of the Wilson River. The then unknown substance was eventually worth more than gold. Osmiridium was found in abundance, associated with alluvial gold deposits, in the Whyte and Savage River areas, though a payable deposit was only found in 1914. Bald Hill, near Luina, became the state's major producer of osmiridium. The demise of the Mersey coalfield in the 1880s accelerated the development of the Fingal Valley coal deposits. The Cornwall Colliery opened in 1886, followed by Mount Nicholas in 1888 and Jubilee in 1897. The region continued to supply coal to Tasmanian industries for almost 120 years. The discovery of scheelite on King Island in 1904 was the first significant mining development of the new century. Established in 1915, the mine operated intermittently until its final closure in 1990. The next major development occurred in 1908, when the Cleveland tin mine opened near Waratah. The mine operated until 1917. Aberfoyle later reopened Cleveland in 1968, and continued to work the deposit until 1986. Meanwhile, the remote Balfour mining field was struggling to re-establish itself after its tin deposits had been worked out. Tin was discovered in about 1884 and productively worked until 1899. Copper replaced tin in 1901, and for the first few years, little mining was carried out. Activity intensified during 1908 and increased to a peak in 1912, while the township of Balfour reached a population of about 500. Unfortunately, the copper did not last. The field rapidly declined and was officially abandoned by 1924. Balfour was the last of the western mining booms. The discovery of wolframite at Rossarden in 1916 led to the formation of the Aberfoyle Tin Mining Company, which operated the Storys Creek and Rossarden mines until 1981. During 1924, new osmiridium deposits were discovered in the Adams River Valley. Almost overnight, Adamsfield replaced the Bald Hill mining field, which had been in decline for about four years. Although iron ore deposits were known to exist at Savage River in 1877, ninety years elapsed before the Savage River Mine became a reality. Opened in 1967, the mine continues to be an important producer. Following the success of Cleveland, Aberfoyle gained a second foothold in western Tasmania with the operation of the Que River zinc-lead mine from 1981 to 1991, followed by a third investment with the Hellyer zinc-lead-silver mine. Located just north of Que River, Hellyer was a rich deposit, which yielded an estimated 15 million tonnes of ore between 1989 and 2000. The most recent mine development occurred in 1996 with the opening of the Henty Gold Mine, which along with Kara tungsten, Railton limestone and Savage River iron, are the only operating mines established since 1900. The remainder, which includes Mount Lyell, Rosebery, Beaconsfield and Fingal Valley, originated from the prospecting boom which flourished more than a century ago. The mining industry has generated enormous wealth for Tasmania. All western Tasmanian communities were established through mining. In north-east Tasmania, some former mining centres like Derby, Branxholm and Mathinna are now supported by farming and forestry. However, tourism is complementing the mining industry throughout the state. On the west coast, visitors are attracted to the stark mining landscape, the ghost towns, the architecture of historic 'boom' towns and mining heritage associated with the many abandoned mines. Tourism has become a value-added component of the Tasmanian mining industry.